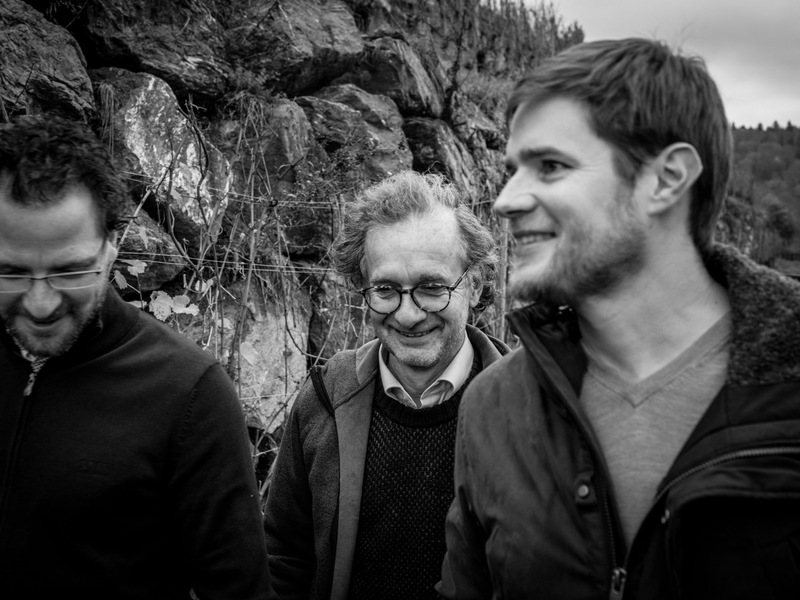 Three STK winemakers take a walk across the famous Nussberg site in Ratsch. Just above it at the Gross winery, they elaborate on the details of winemaking. 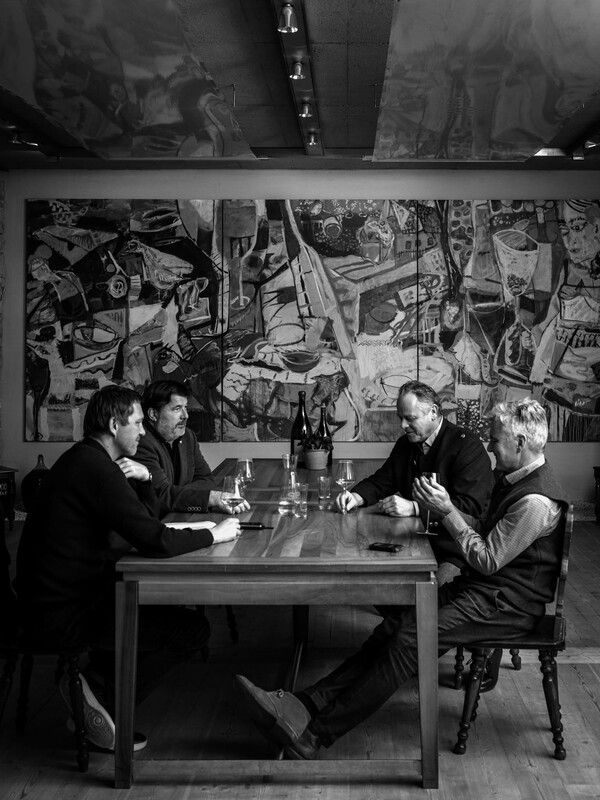 This question brings Georg Winkler-Hermaden, Wolfgang Maitz and Johannes Gross together at the dining table. What are the details that make “the” big difference in making wine? Winkler-Hermaden: If we knew, we would be winners for all times. It is rather a chain of many minor decisions that we take throughout the year. Maitz: A complex topic, as overall conditions are subject to permanent change. Gross: We have climatic variations from year to year, and people are the most insecure factor in it all. The only dependable condition that we can rely on is our soils. That is why we strongly focus on the soil. Winkler-Hermaden: And even there, things have changed. After changing to organic cultivation, we saw that the mineral composition has remained the same, while life in the soil itself has of course changed. This has a strong influence on the growth of the vines. Maitz: For me, the question about details is a matter of where you start from. Since it is always based on experience and the external conditions you deal with. A minor detail for one person can be extremely big for another person. Styria, 30 or 40 years ago, underwent a major development phase. Meanwhile we have gained an idea of what our region is capable of and what we are heading for. So, of course things shift in importance. Let me put it this way: if you stop running and start walking, you see more of the details. Then you can think about changing one detail, or two. Maitz: Georg just said it: with the way we cultivate our vines. We now use more natural products in our vineyards again, instead of industrial ones. So, you must strongly monitor every detail and see how things work out and function. Winkler-Hermaden: 30 years ago we had a problem when the grapes weren’t ripe on time. So, we relied on early-ripening rootstock. Meanwhile we have a situation where at least some sites are ripe a little early. We should perhaps switch back. Maitz: This is influenced by the grape load we tolerate in our vineyards, in the sense of pruning, and that artificial fertilizers are a no go. So, we have smaller yields and grapes are ripe earlier than before. Gross: As a wine maker, you don’t know in advance what reaction follows a certain action. I myself have been making wine for eleven years now. The first vintages in our cellar are the fruit of me and Dad working together. I often used to say: “No, that’s wrong, why not do it this way?” After a really good education I knew more about the details of how exactly fermentation works. But I saw a key element in the detail, ignoring the greater ensemble. Today I know: you do need experience if you want to implement each point of your detailed knowledge. Winkler-Hermaden: We have a quite similar situation at home. When they question this or that I often think to myself: why is this being questioned at all? I am quite bewildered at times. I often have a good discussion with my son Christoph. He has an academic background and knows more than just a thing or two in micro-biology and can explain everything from the chemistry end of things. Gross: Let’s go back to the action itself. 90% of my decisions are taken not because I want to take them but because things are the way they are. The mere difference in how our cellars are built, their layout, makes you have to start from a different angle. It wasn’t my own decision, things are the way they are. Maitz: But the decision was made at some point in time, if by the generation before us. Gross: Up to the question which vats or barrels are available in my cellar. You work within a corridor defined by nature, the winery, and your family. The “details” are lastly actions that we take on this basis. Take Willi Sattler for instance. He decided to mature Sauvignon Blanc in steel. He felt this worked for himself and his terroir, that is how things are, and that’s it. That’s the corridor that he can use. Within this corridor, he can keep his wheels turning. Details are only possible if you are ready to reduce. It was my Dad’s generation that decided to make Sauvignon Blanc the main variety in Styria. Not only because it yielded the best quality in the long run, but also because they wanted to work for a cause. Not: “I want to make the best Muskateller, and also the best Sauvignon Blanc.” That won’t take you anywhere. The two varieties have totally different needs. Perhaps we don’t have enough experience in this matter, or we have lost it over the last century. I sometimes get a similar impression when I read older books on wine. They tell us a lot about how people cultivated and matured the wines back then, and many things we practice again today. Maitz: Between then and now, there was a technical revolution. We are partially going back to the roots as we want to “dig out” what we have. Technical wines can be made everywhere in the world. That is why we are focusing on origin. To make the origin of a wine palpable again is our highest ambition. We talked about vats. The Winkler-Hermaden winery has a particularly consistent detail to offer in this respect? Winkler-Hermaden: We have our own small forestry operation. We use the oaks from these woods to build vats. It was no more than a gag in the beginning but it soon turned out to make sense, since the wood and the wine come from the same terroir. Perhaps there might be a way to get even better wood from somewhere far away, to make even better wines, if only just a little. But we want to bring out the terroir and the character in the wine. 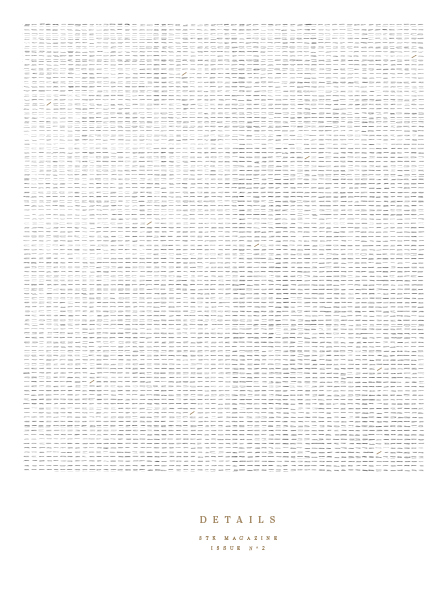 We want our wines to reflect exactly that. Winkler-Hermaden: ... And many varieties. Maitz: Exactly! Now you may ask yourself: is this a weakness or a strength? I believe we should reduce our range of varieties, and let the various terroirs and wineries be the reason for personality in a wine. Details that we sometimes believe are not so important … perhaps not in a young wine, but after five or ten years, they will show through in a wine. Gross: That is what we currently work on a lot in our winery. We have made room in our archive, as we call it, to hold back some wines and make them available for sale at a later stage. To show that wines can evolve over time, and well. Winkler-Hermaden: This idea has come up more and more over the last years, that we say our wines have more potential when aged than when young. The only way to convince people is to let them taste aged wines as often as possible. Maitz: This is a detail that makes STK wineries stand out from others. We endeavor to provide aged wines that have gained in quality. This is what has always distinguished great wines over others: that they become something special with time. A young wine can never represent all the details in the same way. What exactly is the role of time as a factor in making wine? Maitz: In the strive to achieve development in a wine’s personality, time is among the key tools. The annual cycle of a grape, both outdoors and in the cellar, is a logical and valuable trajectory. Winkler-Hermaden: Back in the 1970s, hardly any winery had the wines of the current vintage on sale, this trend emerged no sooner than the 1980s when technology made it possible. Gross: Thirty years ago, technology had a positive connotation. Today, we would rather step back from it again. What’s important is the right use of technology. Some techniques lead us away from wine as a cultural product. If we shun the idea of creating a product in full harmony with nature, then it becomes an industrial product. We should never forget that! The Winkler-Hermaden Winery comes up with a dictum: “Not the size of the step is important but the direction toward which you move.” According to their own website, this has been the credo of Georg Winkler-Hermaden over the past 30 years, now supported by his sons Christoph, Thomas, and Wolfgang. Located on the Kapfensteiner Kogel, the winery meanwhile cultivates 40 hectares in a biological-organic approach, with an eye to biodiversity in the soil. A particular feature is the high percentage of red varieties in South East Styria. Here on a hillcrest above Ratsch an der Weinstrasse, wines develop with a focus on origin. 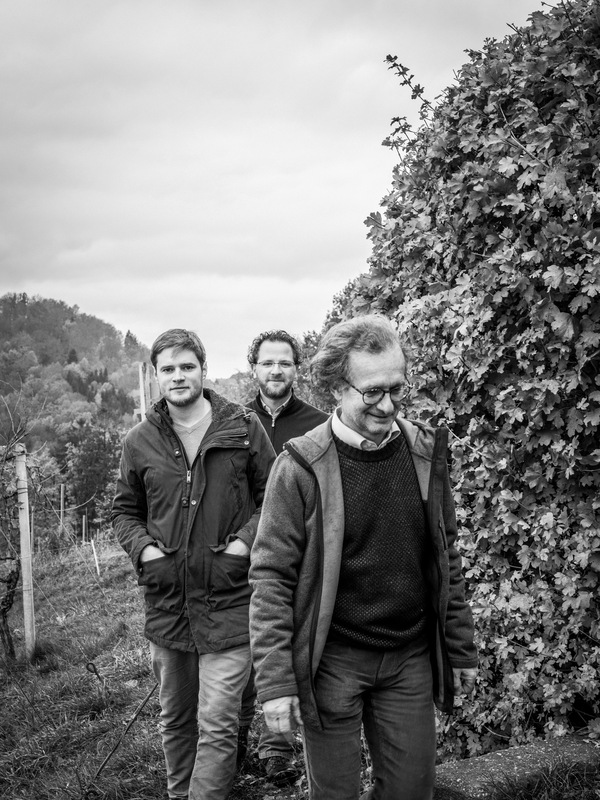 Wolfgang Maitz keeps up the viticultural skills of the family now in the third generation. Standing on the shoulders of their previous work, he is able to cultivate what others first had to establish. His love for detail shows through in the glass. From the hills of Hochstermetzberg, Schusterberg, Krois, and Sulz he extracts authentic, site-specific vintages. Maitz joined the STK wineries in 2013, as a result of his precise and spirited approach. The brothers Johannes and Michael Gross work in the best tradition of their craft. Viticulture in the family goes back as far as 1907. In 1991 father Alois was distinguished as “Winemaker of the Year” by the Falstaff Magazine. The brothers both know the meaning of quality, and how much effort it requires. They have meanwhile implemented this concept in their own work, making wines that are among the best from Südsteiermark and beyond, year after year. Visit them on the Nussberg in Ratsch for a breathtaking view of the Nussberg site and a visit to the cellar, with aged wines, and more.